Otherwise known as: just another excuse to dress like a goth schoolgirl. In the words of Cher herself: "Classic!" 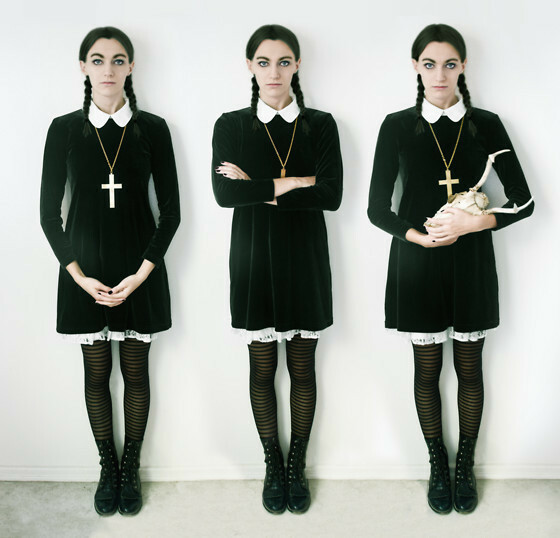 Perfect for people who hate Halloween — just wear black and scowl. All you need for the queen of Bayside is a school sweatshirt, some floral spandex, and some teased bangs. Leather jacket + flare pants + stake = Buffy. Now you don't have to tweeze your eyebrows for the month of October. OMG you guys are awesome. Get a log. Act weird. Bam. Halloween costume. Although it came out in 1988, '90s girls watched this movie on VHS obsessively. If you don't happen to have a red '80s prom dress lying around, you can always do a schoolgirl outfit — just get those spiky bangs right and you're good to go. As long as you don't do the high-pitched voices all night, this could be totally cute as a trio costume. Ohhh, the choices with Gwen. Are you going to be Rock Steady Gwen? Harajuku Gwen? Bindi Gwen? Blue-hair Gwen? Otherwise known as you, 15 years ago.